New traders are very enthusiast and are eager to learn as soon as possible. There are some thumb rules which might help them learn trading skills within seven days. Investors taking their first steps towards the stock market trading usually have to access multiple sources of primary education through books or online platforms. New traders are very enthusiast and are eager to learn as soon as possible. 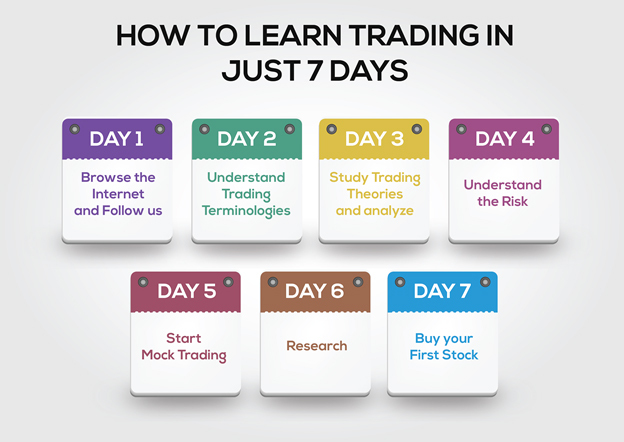 There are some thumb rules which might help them learn trading skills within seven days. Firstly, to learn the basics of trading, access the compendium of information available on online trading sites, magazines, books, most of which are inexpensive to access. Also, watching related videos on YouTube can help in understanding the trading concepts. Next is to understand key terminology. Watching business news on TV and staying updated through different websites will help relate the concepts in a real-world scenario and understand them better. By the third day, one should be in a position to understand trading theories and, hence, should start with basics of technical analysis by looking at and understanding the price charts in various frames. Fundamental analysis offers a better path to profits because it tracks growth curves and revenue streams, but traders in real market undergo price changes that diverge entirely from fundamentals. Thus, it becomes imperative for beginners to understand and analyze these charts thoroughly. Also, there are many books available like Stock Market Wizards, Trading for a Living, and so forth. Once familiar with technical analysis, it becomes critical to understand risk. Many investors buy and sell every minute on a trading day and thus affect the share price of the stock. Markets are dynamic in nature; they can fluctuate in no time. Market dynamics is a prevalent condition which makes it very important to judge the situation through a proper understanding of the situation. Hence, it is essential to calculate risk before taking an investment decision. Mock Trading: This is a simulated stock market where one can learn and explore real market conditions to get on-the-job experiences. Simulated trading is an online program through which a trader can develop his/her skills and practice trading in the market without risking a penny. Beginners can feel completely comfortable trading without actually spending their money while getting a hang of the stock market at the same time. This experience is valuable and allows one to gauge their readiness for using real money in real time. Analyzing and researching the companies and its industries before actually investing is a strict requirement. It is very crucial to decide on the best stocks to invest using analytical and technical skills learned in the previous days. Buying the first stock: This is the day when one uses all the information he/she has grasped in the last few days and purchases their first share. This exposure is the final step which ensures his/her actions towards a future trading career. A trader should continue to follow online trading platforms to brush up his/her knowledge and stay updated with the market. The journey of trading begins on this day. Hence, one should ensure that they never forget the thumb rules for a prosperous future in stock market trading.